Click on pink-border photos for full size, high resolution photos. You won't regret it. I ran halfway back to the bus from Notre Dame and passed a few pet stores along the way. Paris used to have city “pooper scoopers” but shortly before my Groundhog Day visit, budget cuts forced them to lay off their canine santitation bridgade. You can no longer legally let your dog crap on the sidewalks without picking it up. I entered one pet store and suddenly realized where all the crap had gone. It was as if I'd shoved my nose up a dog. I turned and left. 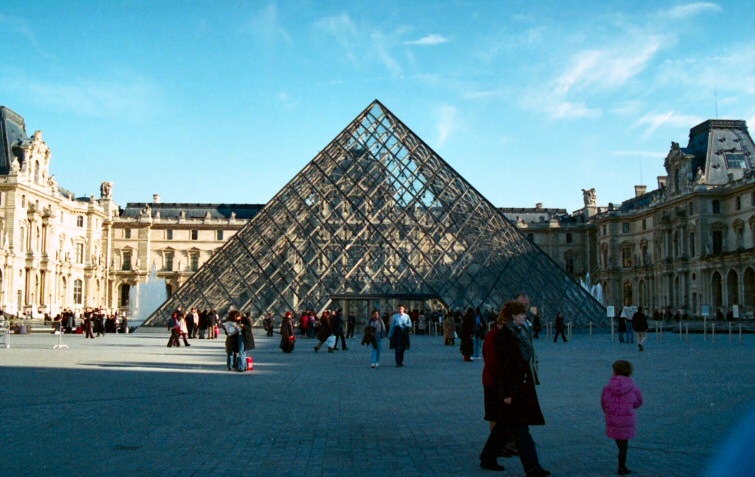 I wanted to visit the Louvre (above and left), the world famous art museum, but by the time I arrived it was already 3pm. 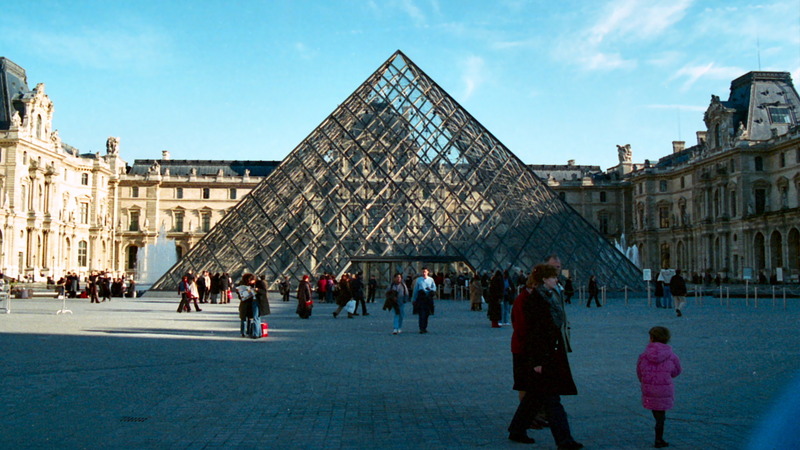 They say to fully experience the Louvre it would take a week. 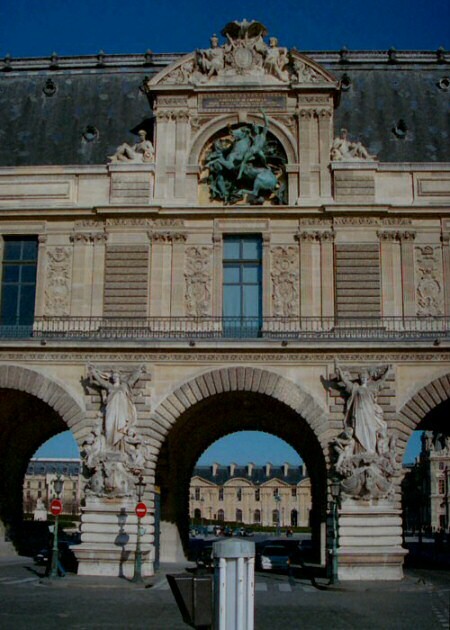 Paris is worse than Washington D.C. in that there is so much history to absorb, it would take months to see everything. It’s overwhelming to a day-tripper like myself, like staring at Niagara Falls holding a sponge. It took 15 minutes just to find the entrance to the Louvre. It sits on eight city blocks (55 acres) with 645,000 square feet of exhibition space, contains 30,000 works of art, with an additional 9,000 catalogued (I assume that means they own them but don't display them). I needed to see 8.3 pieces a second. I was running out of time and knew I would not be able to even get into the Louvre in time to make it back by 4pm, so I thought perhaps I could check out the Ritz Hotel. That didn’t work either. And then, I was stranded at the Place de la Concorde in heavy traffic and couldn’t get out. I saw the Obelisque, an Egyptian monument that looks exactly like the Washington Monument. It’s the oldest monument in Paris, and was given to France by Egypt in appreciation of the French restoring their monuments. 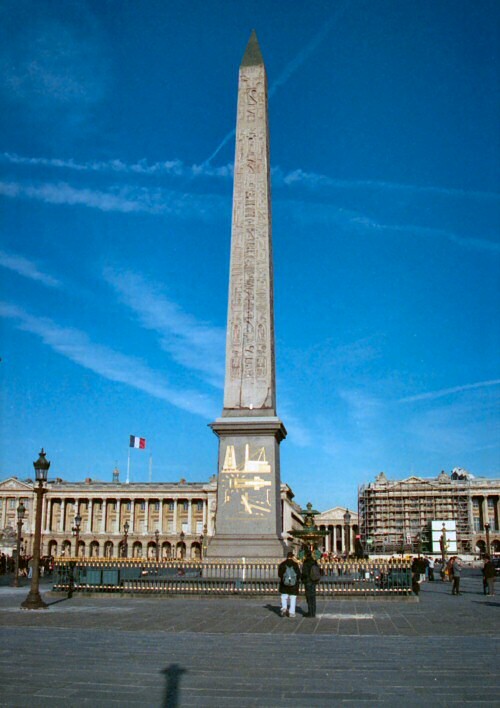 In the 19th century the 3200 years old Obelisque from the temple of Ramses II at Thebes was installed at the center of the Place de la Concorde. It stands 75 feet tall in pink granite and weighs 230 tons. In 1831, it was offered by the Viceroy of Egypt to Louis Philippe. Three obelisques were offered, but only one was transported to Paris. The French, in return, presented Egypt with a clock that didn’t work--that’s what the French tour guide said. The obelisque - sometimes dubbed 'L'aiguille de Cléopâtre' or Cleopatra's Needle (actually, it could be argued that a more apt title would be "Cleopatra giving the finger" after her clock broke)-- is covered with hieroglyphs picturing the reign of pharaohs Ramses II & Ramses III. It's one of those things that could easily thimble-ize Paris. All I saw was another pointy thing. It's flanked by the beautiful green fountains you see below to the left. The Parisians seemed to be very aggressive drivers, and didn’t always stop. I walked across the road with an elderly lady in part because I'm a Boy Scout at heart, and to make a larger target. I witnessed another lady scream as she was nearly clipped by a car. I walked around her and forced the next car to stop so we could cross. There were six lanes of bumper-to-bumper traffic surrounding the Place de la Concorde, and I couldn't move or find any crosswalks. For five minutes I was paralyzed, unable to get off my island. My two choices were--live at the Place de la Concorde for the rest of my life (I'd never miss a Tour de France), or go for it and pray I don't lose my head. So here's a little history on the place I nearly moved in to--In 1763, a large statue of King Louis XV was erected at the site to celebrate his recovery from a serious illness. 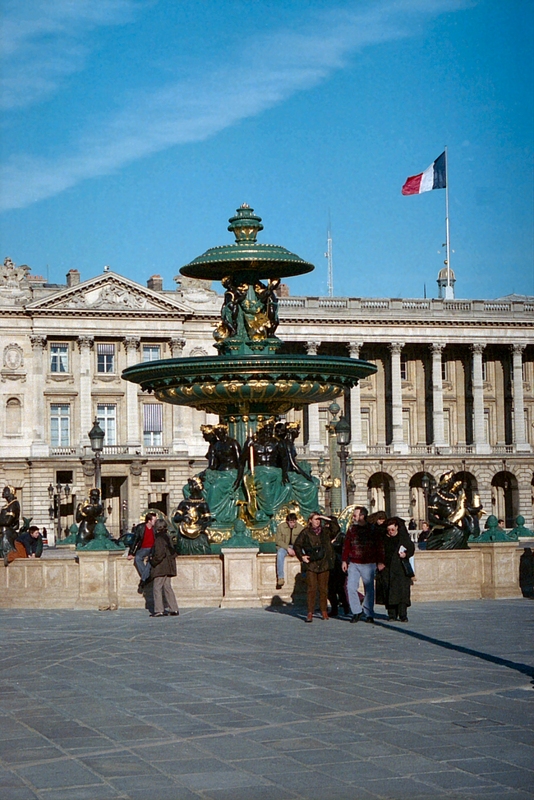 The square surrounding the statue was created in 1772 by architect Jacques-Ange Gabriel. It was known as the place Louis XV. In 1792, during the French revolution, the statue was replaced by a large statue, called 'Liberté' (freedom) and the square was called Place de la Révolution. A guillotine was installed at the center of the square and in a only a couple of years, 1119 people were beheaded there. Amongst them were King Louis XVI, Marie-Antionette, and revolutionary Robespierre, to name a few. I assume the clean-up crew would've been high on the priority list to cross-train into canine sanitation once heads stopped rolling. 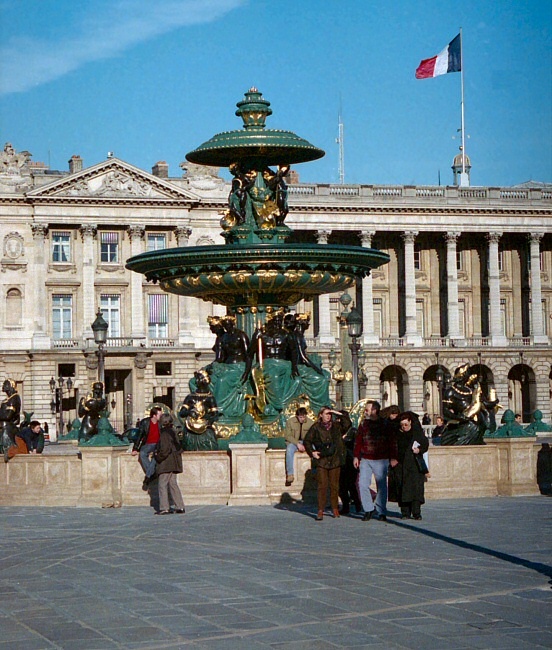 After the revolution, the square was renamed several times until 1830, when it was given the name 'Place de la Concorde'. Phew! That killed five minutes. Meanwhile, I'm still stranded. One lane slowed somewhat, so I streaked across six lanes of heavy traffic and over 30 meters of roadway, taking one lane at a time. It’s the stupidest thing I did on my European trip. When I reached the other side, still breathing, checking my back for tire tracks, I felt like Rocky Balboa. 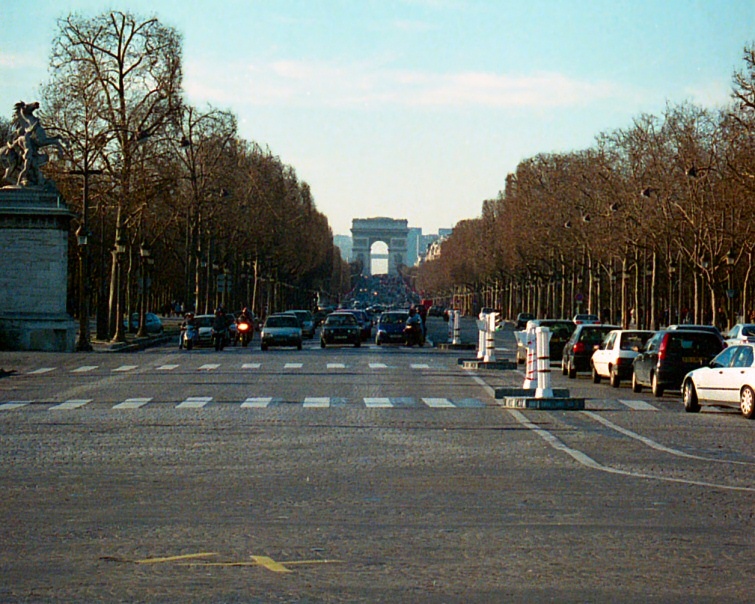 Off to my right were another four lanes of traffic on the Champs Elysees, waiting to pounce. I shot this really cool photo (below) from the middle of the road just before the light changed. This is also the final turn of nearly every Tour de France. 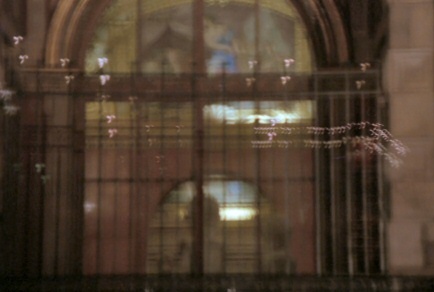 Oh great--yet another way I can be accidentally killed in Paris. That little cross bar you see in the opening of the Arc de Triomphe is the Grand Arch which sits about a mile down the road behind it. The Grande Arche was inaugurated in July 1989, and marked the bicentennial of the French revolution. 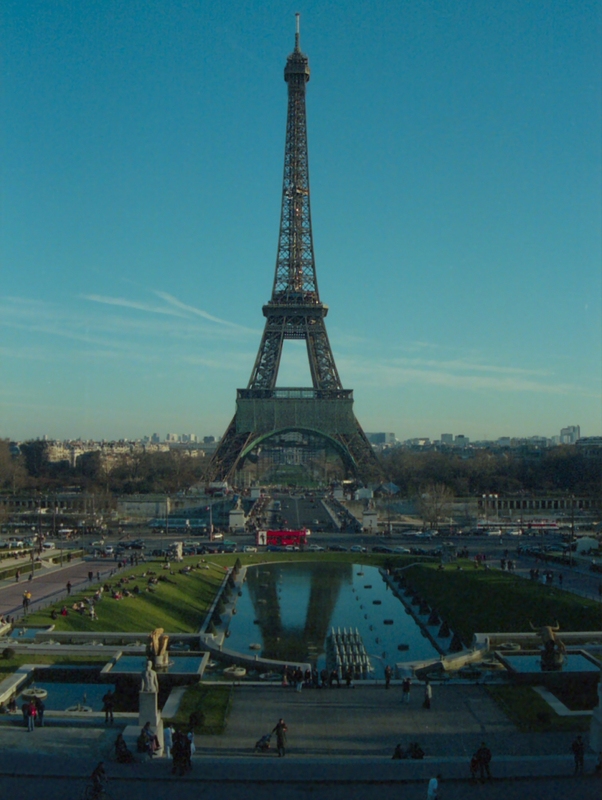 It completed the line of monuments that forms the Axe historique running through Paris that include the Arc de Triomphe and the Arc de Triomphe Carrousel. The Arch is almost a perfect cube (width: 354 feet, height: 361 feet, depth: 367 feet). It has a prestressed concrete frame covered with glass and Carrara marble from Italy and was built by the French civil engineering company Bouygues. 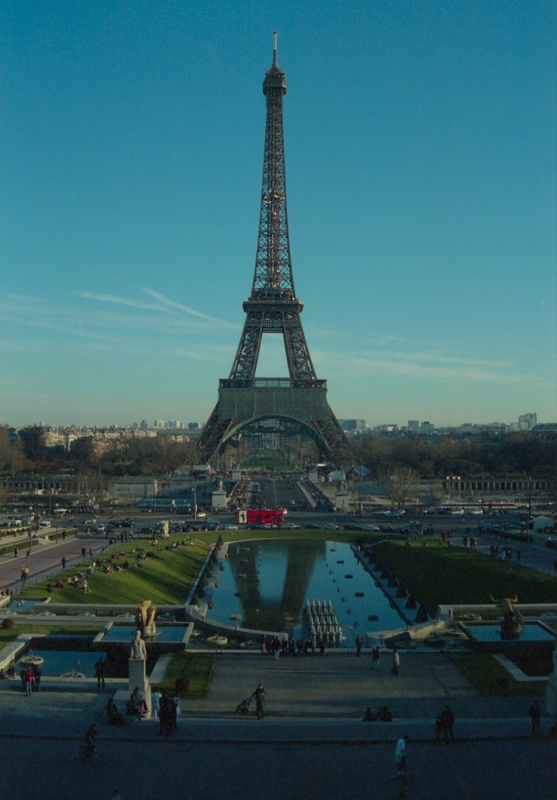 I never saw it, although you can also see the Grand Arch from one of the Eiffel Tower photos. When I reached the bus at the pickup point, there was no one there. I visited the Palais de Chaillot again, opposite the Eiffel tower, then came back down at 4:30pm to find I had an extra 30 minutes. But it was too late to go anywhere and I was too tired. I hadn’t drunk a thing all day or eaten anything for six hours and I'd been running/walking the whole time. Just to and from the sights, I'd covered over 8 1/2 miles on foot, I'd been on my feet for eight hours straight, and I was beat. 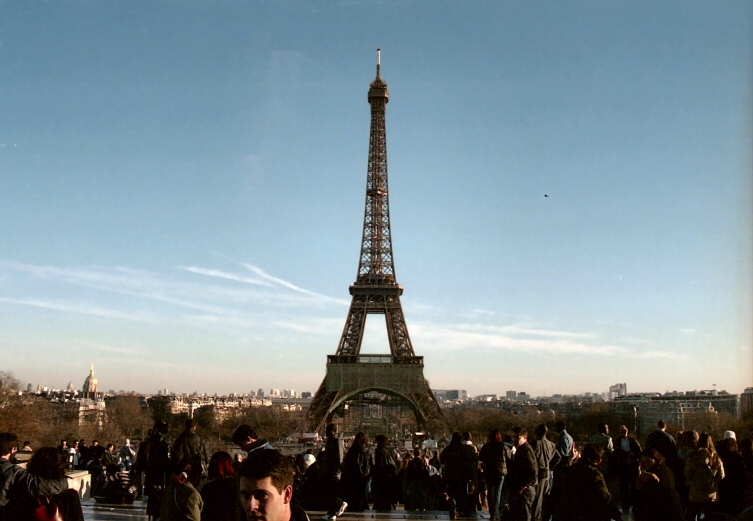 Paris was a tiring city. I sat on the sidewalk with a few others and we talked on a variety of subjects. They were all very nice. One lady was from Virginia Beach, Virginia (30 miles from where my house was) and another older man was from Illinois, 21 miles from where I live now. Two of the ladies from my bus didn’t show up on time--one had fractured her arm and became lost. After waiting for 45 minutes, the tour guide was called on her cell phone. The ladies were at the American Embassy behind the Place de la Concorde. We drove there and waited another 30 minutes for them to show up, then tried to drive home, but by this time we’d missed our window of opportunity and were caught in a Paris traffic jam. They replied,”Yeah” to which I replied,”I didn’t get to see that today! Could you duck for a second?” I zoomed in on and shot this photo (which was underexposed) across the aisle of the bus, out the window, and through the window of the world's most renouned art museum. If you look closely at the top of the photo, it appears some lady is floating in the air with a sky-blue sash. Every cloud has a silver lining. We kept ourselves amused by laughing and pointing at crazy drivers surrounding us. Most of them had badly dinged cars. We had a blast trying to ignore the fact we might never get out of Paris in our lifetimes, but since Paris is sometimes considered the center of the world, it would be a good place to die. Although, when I think of it, why would the center of the world be literally named "par-is". Does that mean everything south of Paris is below par? We finally escaped the City of Lights and on the way back to Kaiserslautern, Germany, stopped at a restaurant in the countryside. It was delicious. Their spinach was perfect. I guess they redeemed themselves.